For those of us who are not familiar with fishing there are a variety of different tents available for the keen fisherman who wants to experience the great outdoors and the calm of fishing regardless of the weather conditions. Indeed it is said that if the weather is poor the fishing is better so what better way to keep dry and enjoy the thrill of the underwater chase than in a fishing tent. Bivvies are normally one or two man tents which are narrow but wide enough to accommodate a chair, fishing equipment or two seater chairs. Bivvies are built on a strong but flexible frame which is covered with a durable material that can withstand strong winds and even stronger rain. Bivvies also have wide fronts that zip up and over (rather like a family camping tent) but are narrow enough so that they can be positioned at the river's edge for better fishing. As the name might suggest these tents are in the shape of a dome which makes moving inside easier and allows for more leg room. Most domes come with a zip up and over flap just as Bivvies do but with the addition of a very fine netting that allows for the capture of small flies and other airborne insects. Domes however are wider than Bivvies and cannot be erected as close to the river's edge but they do allow for more storage space as well as more room for occupants. Domes come in one, two and three man sizes and can be easily erected and folded down as and when required - perfect if the weather turns nasty. If you are new to fishing or are considering making it more than just an occasional hobby there are a few things to consider when buying a fishing tent. The first factor is: Where are you going to fish? Most fishermen have a particular river or stretch of water that they like to fish in. 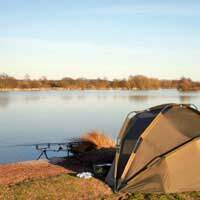 It can be a small river, a brook, on the side of a pier or in a reservoir but wherever it is you must be sure you have the right tent for you. You should also consider how many people are you likely to have to accommodate. If you fish solo then a one man bivvy is ideal for you - it will accommodate you and your equipment comfortably and allow you to be closer to your chosen water's edge. If you and a friend or friends expect to go fishing and expect conditions that are perhaps not as favourable as some might hope then a two man bivvy or dome is more than adequate for your needs. This is something that only you can answer - everyone has a different budget and searching the Internet will unearth a myriad of fishing equipment sites that have everything the serious fisherman could want. It is important nonetheless to ensure that however much you spend you get your money's worth from it. With this in mind it is wise to consider how many times in the course of a year you will fish, where you will fish, and how many people - if not just you - will have to shelter from the blistering summer sun or the driving winter rains.